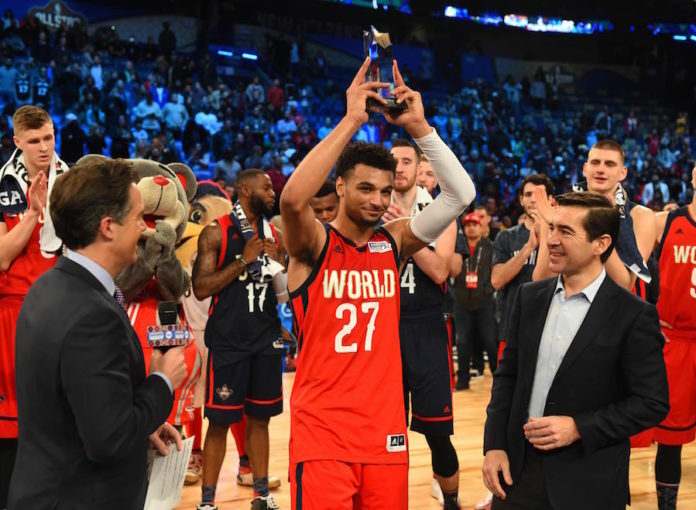 Jamal Murray will have the opportunity to defend his Rising Stars MVP title. The NBA announced Wednesday that the second-year Nuggets guard from Kitchener, Ontario was selected for the World Team for the Mtn Dew Kickstart Rising Stars Challenge on Friday, Feb. 16 at Staples Center in Los Angeles during the 2018 NBA All-Star festivities. This will be Murray’s second-straight year appearing for the World Team. 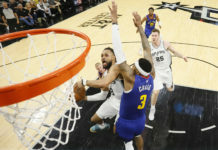 Murray was named the 2017 BBVA Compass Rising Stars Challenge MVP after posting 36 points and 11 assists — both game highs — in a 150-141 Team World victory. Murray has appeared in 46 games (all starts) for Denver this season. The No. 7 overall pick in the 2016 NBA Draft is averaging 16.2 points, 3.5 rebounds and 2.7 assists in 29.8 minutes per game in this, his second season. Murray ranks second in scoring per game (16.2), second in total field goals (269), second in total three point makes (87) and ninth in assists per game (2.7) among second-year players. He also ranks third overall in the NBA in free throw shooting percentage at 92.4%. The former Kentucky Wildcat has posted 20-plu points 17 times and 30-plus points six times, both the most among all players under 21 years old. He posted a career-high 38 points (14-19 FG) to go with five boards and six assists vs. Portland on Jan. 22, just one game after tallying 30 points, five rebounds and two assists vs. Phoenix on Jan. 19. 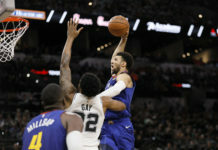 Those performances put Murray among an elite group, including Anthony Davis, Karl Anthony-Towns, Damian Lillard, Joel Embiid, Blake Griffin, Kevin Durant and LeBron James, as the only first- or second-year players since 2001 to post 30-plus points, 5-plus rebounds and 2-plus assists in back-to-back games. Last year Murray was joined on the World team by fellow Nugget Nikola Jokic. Now in his third season, Jokic was no longer eligible for the Rising Stars Challenge. Murray became the third Denver Nugget to claim the Rising Stars MVP. Carmelo Anthony won the award in 2005, and Kenneth Faried won it in 2013. Murray now has a chance to carve his own place in the game’s history — an MVP in 2018 would make Murray the first game’s two-time winner. Joining Murray on this year’s World team is Philadelphia 76ers’ Joel Embiid (Cameroon), Ben Simmons (Australia) and Dario Saric (Croatia), the Sacramento Kings’ Bogdan Bogdanovic (Serbia) and Buddy Hield (Bahamas), the Memphis Grizzlies’ Dillon Brooks (Canada), the Chicago Bulls’ Lauri Markkanen (Finland), the New York Knicks’ Frank Ntilikina (France) and the Indiana Pacers’ Domantas Sabonis (Lithuania). They will face the U.S. 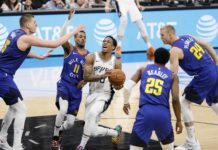 Team, which includes reigning Kia NBA Rookie of the Year Malcolm Brogdon of the Milwaukee Bucks, the Los Angeles Lakers’ Lonzo Ball, Brandon Ingram and Kyle Kuzma, the Boston Celtics’ Jaylen Brown and Jayson Tatum, the Atlanta Hawks’ John Collins, the Bulls’ Kris Dunn, the Utah Jazz’s Donovan Mitchell and the Dallas Mavericks’ Dennis Smith Jr.